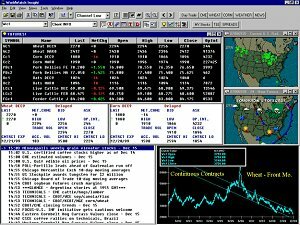 The WorldWatch Insight workstation application represents the latest in object oriented technology by providing a robust set of features for viewing and manipulating vendor data and news on Microsoft Windows based workstations. Automatic recovery in the event of communications fault. Automatic, immediate request for log-on to a back up Gateway Server. Appropriate error messaging to user. Server Redundancy to thirty-two defined backup servers. Workstation messaging and alert generation. WorldWatch Insight presents the very latest in user interface technology with a full menu and command line interface for their individual preferences. 100+ Smart Lists, also used as Limit Minder lists and Tickers. 100+ personal Custom Pages and personal Smart Displays. WorldWatch Insight is available as a standalone service or as an add-on for other internet based applications for the single user. For SMB and Enterprise usage contact DataCode at info@datacodeinc.com.